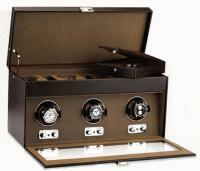 Triple winder with storage in beautiful brown leather with a brown fabric interior. 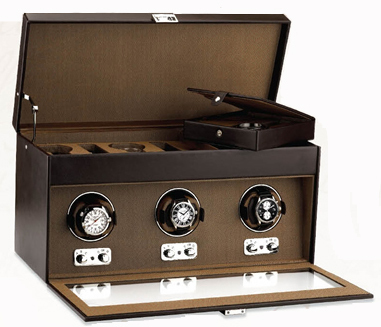 The design rationale for all Wolf Designs rotators is to wind the mainspring of a movement, and then 'sleep' for a period of allow the mainspring to release its tension. This is accomplished with a nominal amount of electrical energy being spent, and a premium placed upon reliability. 600 Turns Per Day. 10 second start delay or 12 hour start delay Clockwise, Counter-clockwise or Bi-directional rotation programs. Intermittent rotation with pause and sleep phases pre-programmed. Runs on either AC power or D-cell batteries.